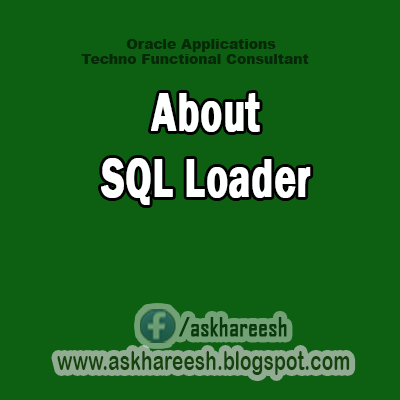 SQL LOADER is an Oracle utility used to load data into table given a datafile which has the records that need to be loaded. SQL*Loader takes data file, as well as a control file, to insert data into the table. When a Control file is executed, it can create Three (3) files called log file, bad file or reject file, discard file. Log file tells you the state of the tables and indexes and the number of logical records already read from the input datafile. This information can be used to resume the load where it left off. Bad file or reject file gives you the records that were rejected because of formatting errors or because they caused Oracle errors. Discard file specifies the records that do not meet any of the loading criteria like when any of the WHEN clauses specified in the control file. These records differ from rejected records. The data file can be in fixed record format or variable record format. Variable Record Format would like below where the data fields are separated by a delimiter. Note: The Delimiter can be anything you like. In this case it is "|"
OPTIONALLY ENCLOSED BY '"' --the values of the data fields may be enclosed in "
OPTION statement precedes the LOAD DATA statement. The OPTIONS parameter allows you to specify runtime arguments in the control file, rather than on the command line. The following arguments can be specified using the OPTIONS parameter. LOADDATA statement is required at the beginning of the control file. INFILE: INFILE keyword is used to specify location of the datafile or datafiles. INFILE* specifies that the data is found in the control file and not in an external file. INFILE '$FILE', can be used to send the filepath and filename as a parameter when registered as a concurrent program. INFILE '/home/vision/kap/import2.csv' specifies the filepath and the filename. INSERT -- If the table you are loading is empty, INSERT can be used. APPEND -- If data already exists in the table, SQL*Loader appends the new rows to it. If data doesn't already exist, the new rows are simply loaded. TRUNCATE -- SQL*Loader uses the SQL TRUNCATE command. INTOTABLEis required to identify the table to be loaded into. In the above example INTO TABLE "APPS". "BUDGET", APPS refers to the Schema and BUDGET is the Table name. OPTIONALLY ENCLOSED BY '"' specifies that data fields may also be enclosed by quotation marks. TRAILINGNULLCOLS clause tells SQL*Loader to treat any relatively positioned columns that are not present in the record as null columns. SQL*Loader loads the tables, creates the log file, and returns you to the system prompt. You can check the log file to see the results of running the case study. Place the Control file in $CUSTOM_TOP/bin. Define the Executable. Give the Execution Method as SQL*LOADER. Define the Program. Add the Parameter for FILENAME. You can skip columns using the 'FILLER' option. here the column name will be skipped.